Welcome to 'The Rosewood', a Charming 2 Bed House originally built by the adjacent Movie Studios to accommodate visiting Stars in the Golden Age of Hollywood. Centrally Located in Historic Mid-Wilshire next to Paramount Pictures, Hollywood, Larchmont Village, Los Feliz, Silver Lake, Koreatown, Downtown and 10 mins to Universal Studios, Beverly Hills & The Grove. A fully refurbished Luxury Bungalow with Private Yard & 2 Private Parking Spaces. Don't just visit Hollywood, be a part of Hollywood! 'The Rosewood' is a stand-alone cottage built in 1921 and although we have kept a lot of the house's history in tact, it is fully modernized with all amenities and luxuries you could hope for. When looking for places in LA, Air Conditioning and Private Parking are not standard - but The Rosewood offers you both! There is a private driveway for up to 3 cars (Cadillacs optional). Further upgrades include: a brand new bathroom, so that you can get ready for those big nights out, and a remodeled kitchen with marble surfaces and stainless steel appliances, so that you can prepare a gourmet meal with fresh ingredients from the local Farmer's Market! Also available are a coffee maker and toaster, iron and ironing board, dish washer, washing machine, dryer, hair dryer hair and beauty products, HD Smart TV with Cable (200+ channels), Fireplace (to muse over a good book in front of), High-Speed Wi-Fi, BBQ Grill... everything to make your stay in this historic LA neighborhood as comfortable as possible. The entire house is yours for the length of your stay. We are happy to provide you with as much or as little interaction as you desire. We can welcome you when you arrive and give you a 'tour' of the house, or we can provide you with self check-in instructions so that you can let yourself in at your convenience (most people prefer this option). If you require 1 or 2 additional rollaway beds for the common space please make a request prior to the beginning of your stay so that we can accommodate. Long before Beverly Hills was 'Beverly Hills', there was Mid-Wilshire, one of the oldest, most affluent, architecturally well-preserved and star-studded neighborhoods in Los Angeles. 'The Rosewood' cottage was originally built to house visiting movie stars back in the Golden Age of Hollywood, though the real stars here are the centuries old Californian palm trees that line the streets of Mid-Wilshire and have become an LA staple! The neighborhood features prominently in TV shows like 'Private Practice' and 'Castle' and tons of movies. The studios are constantly filming around the neighborhood, so if you want to catch real production in action you're in for a treat. We are big foodies and love the restaurants around here but don’t take our word for it- even celebrity chef Anthony Bourdain testifies to all of its amazing places to eat, drink, and hang out in our neighborhood! Walk one or two blocks East and you are in Koreatown, home to the best Korean BBQ in the world (seriously, it's better than in Korea according to Koreans)! The nearby Koreatown bars will blow you away. Our favorite bar, 'Blipsy's Barcade', has cheap drinks, 25-cent 80s arcade games, and an unmatched jukebox. It's empty before 10, and after it fills with supercool 20-somethings. Also check out 'The Copper Still', a more upscale intimate bar with specialty artesian cocktails concocted with care unlike anywhere else in the city. With Uber & Lyft it is no longer necessary to have a car in LA, though it is a spread out city so you will most likely get into at least 1 car during your time here. Like the immortal movie 'Clueless' noted, "Everywhere in LA takes twenty minutes!" If you don't have a car, don't fret. Contrary to popular belief, LA has a very comprehensive, reliable, and safe bus system. There is good transit around us with many nearby bus routes. Hi! I'm Laura from LA Space and together with my husband I live and work in Los Angeles. We are what you might call the typical Hollywood couple - a music producer and an actress :) We love to travel and have been to over 50 countries, many by VRBO/HomeAway. 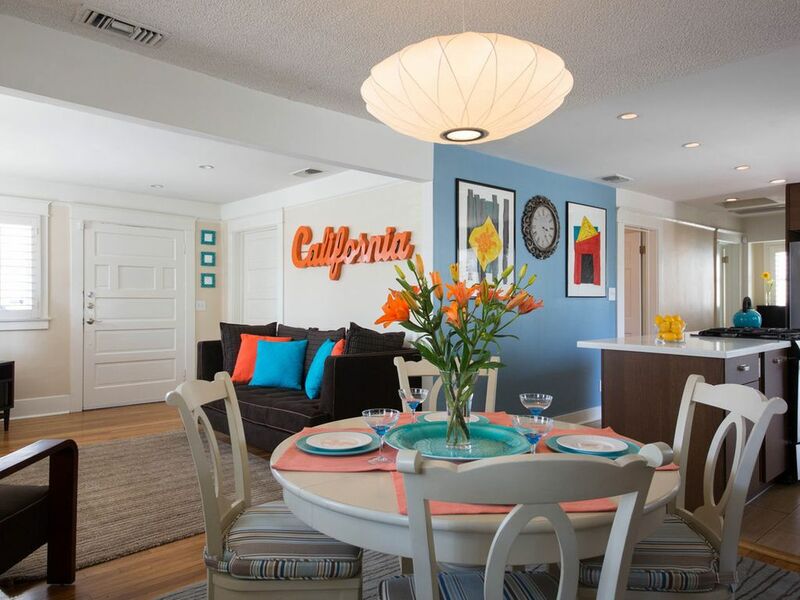 We're excited to welcome you to our city and whisk you away on your California adventure! Although we have kept a lot of the house's history in tact, it is fully refurbished and modernized with all amenities and luxuries you could hope for. When looking for places in LA, Air Conditioning and Private Parking are not standard - but The Rosewood offers you both! There is a private driveway for up to 3 cars (Cadillacs optional). Further upgrades include: a brand new bathroom, so that you can get ready for those big nights out, and a remodeled kitchen with marble surfaces and stainless steel appliances, so that you can prepare a gourmet meal with fresh ingredients from the local Farmer's Market! The bungalow is located in historic old Hollywood right by Paramount Pictures. It is moments from Larchmont Village, Los Feliz, Silver Lake, Koreatown & Downtown. All of these neighborhoods have excellent restaurants, public parks, libraries, tourist attractions, museums, theaters and shopping. 10 mins by car will take you to many popular destinations including Universal Studios, Beverly Hills, The Grove and Museum Row. Central A/C throughout with NEST control. There is a private driveway, it is gated. High-Speed WIFI available throughout the house. 50" Smart HDTV with Netflix, Hulu & Cable (200+ Channels), Vinyl Player, Books, Games all available. We always keep a few bits and pieces stocked for our travellers. Prepare a gourmet meal from the local Farmer's Market in the completely remodeled kitchen featuring stainless steel appliances and stone surfaces! Enjoy the secluded garden with palm trees, fruit trees and succulents. If you're looking for a place to party then this is not that. Please be respectful and do not bother the neighbors as not everyone in Los Angeles loves vacation rentals as much as we do! If you have any questions or concerns you can reach out to us 24/7. Small but well kept, this is indeed a bungalow. The bedrooms are simply furnished and right next to each other. The living area is comfortable, clean and attractive. But the bedrooms are steps away from the street and we had not one good night’s sleep while we were there....construction which started at 7 am and a car alarm that went off all hours of the night. While these are beyond the owner’s control, I would not recommend this house for anyone with young children or light sleepers. In another location, this house would be a perfect stay. The home is just as described and pictured. Beds were comfy, and house was in a very quiet neighborhood with lots of privacy. Will definitely stay again. My teenage boys and I traveled to LA for a brief trip to see an NFL game. This house was perfect for the three of us. Great kitchen! Really clean and well kept. Very nicely decorated. Very easy to access Uber and Lyft... cars always available within minutes. Has a driveway to park a car. Price for everything we had was better than any hotel room we could have found. I would highly recommend this home. Great home, great location and so clean! The owner was very responsive and accommodating. The home was as described and so clean! My family enjoyed our stay. Would stay again when back in the area. We rented this house for our trip to Universal Studios and glad we did that. This house is very well managed with all amenities one will need for his/her stay. Location is very central with easy access to freeways, Universal and Hollywood / Griffith Observatory. Laura was nice and was able to provide us with all information even with recommendations to local food joints. Overall our stay was very relaxing and will highly recommend if you want a clean and spacious rental. Excellent space and location. Everything was as expected. Rates may alter daily and are subject to change until reservation is confirmed.